I used to love to walk to school on sunny Spring mornings. The quieter hours still possessed of the mossy, dewy scents of the night – mildest of breezes softly stirring the trees of the park, and dappled light – already suggesting the new dawns that would awaken the synapses of my ever dawdling, day-dreaming brain. Yes. I have long thought myself familiar with the colours of the spectrum; that I could name them, that I could assign to each a musical note, that I owned favourite orchestral symphonies of light. But every new day brings surprises – and the sometimes primal response that mists our sight with tears of yearning, or recognition, or unknowing, or delight, or prayer, or a sense of the most exquisite new openness to the charism, the gift of the Universe offering her provision – the ultimate and eternal grace of Love. 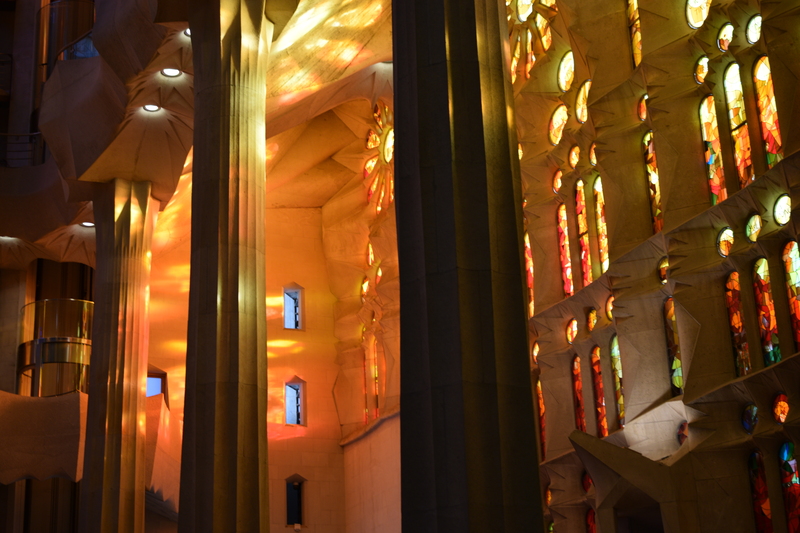 And I was surprised indeed by the glory and the colours I encountered in Barcelona’s great Temple of Light. In La Sagrada Família I mistily knew myself a member of the one great and ‘Holy Family’ – the Universe herself. No single one of us ever fully cognisant of the glories of creation’s rainbow – while each of us is graced with ever-changing experience of hues and colours yet unnamed. Good to meet you yesterday and what a dauntingly talented group. Love the Barcelona photographs. Many thanks Colin. I was delighted to meet you too – and have been similarly daunted – and delighted – by your own wonderful photographic website. See you soon.